Jungle lovers, it’s time to meet the cheeky monkey and compete for huge wins. Now experience two scatter symbols, and wildcards that multiply your wins by three! 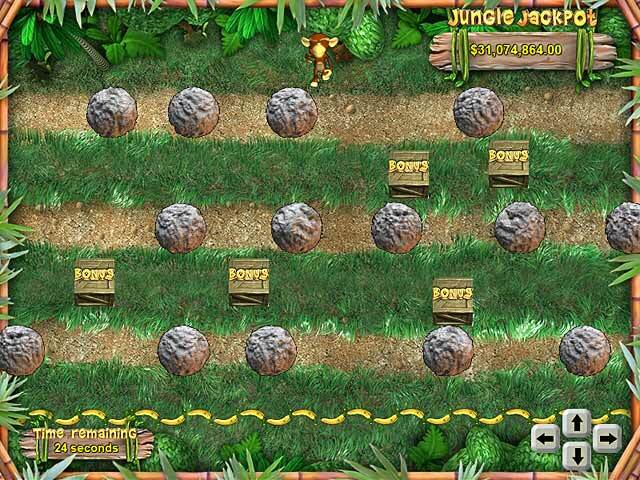 The mischievous Monkey acts as the wildcard and substitutes for all symbols except scattered butterflies and bananas. 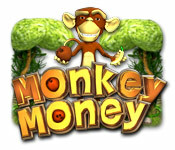 Explore the zany Jungle Jackpot and compete for prizes in Monkey Money. Monkey Money is rated 3.4 out of 5 by 7. Rated 3 out of 5 by Distraida01 from One Feature Doesn't Work There is a feature on this game known as "Power Bet" you can get it x5, x10, x20. At first I thought it meant that you'd have your bet increased (for "free"), 5, 10, or 20 spins. But it only increases your bet for 2 spins. Then I thought maybe it increases your win by 5, 10, or 20 times. But it doesn't do that either. No matter which of the power bets you get, the only thing it does is double your bet for free for 2 spins. Otherwise the rest of the game is just as it should be, and is fun to play. 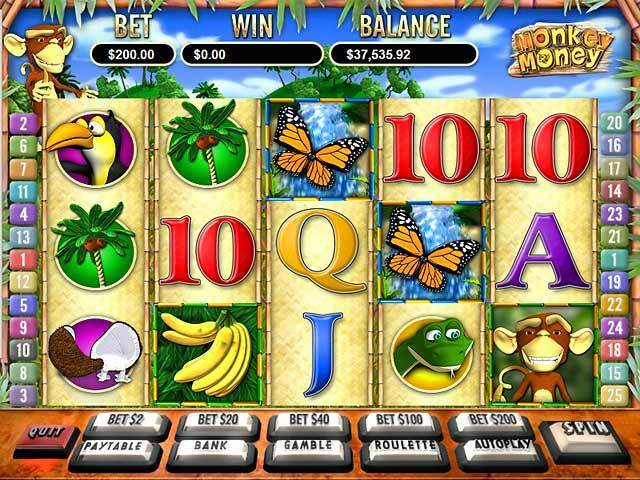 It gives you a lot of free spins <3. 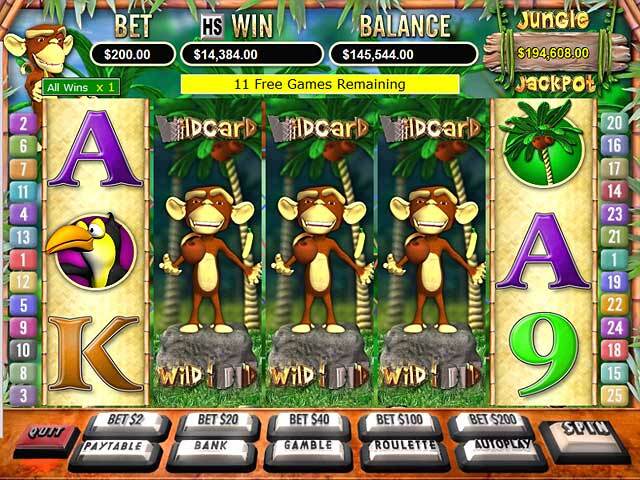 Rated 3 out of 5 by maxxie54557 from Hmmmm If you loke the slots, this is kind of fun. Gets monotonous after awhile. Hard to get the bonuses. But I sure wish I could collect all the money I earned on this game! Rated 2 out of 5 by mrm2006 from Huh? Don't like slots so I don't play them. However, it appeared there was at least a roulette game (or something similar to it) and even perhaps another game the description referred. Couldn't figure anything out that wasn't related to the Slots game. Can't review something I couldn't figure out how to play. Reading a tutorial is ever so much more fun and captivating and informative than having a tutorial take you through every aspect of a game (as in an HOG or an HOPA). NOT. Don't make me read an instruction manual. I have a car, cell phone and a coffee machine that I have to do that for to know how each functions to it's beat ability. It's a game, take 5 minutes and walk me through it - trust me when I say I'll understand it a LOT better. "nuff said. Money Monkey made a BIG MONKEY out of me. This Glam-ma cannot in good conscience recommend a game she couldn't play, even for a few minutes. This review is meant to reflect my unbiased opinion of game play - mine and mine alone. However, if this review was helpful, please click on the "yes" button below. If not, likewise for the "no" button. Seriously? You would give your own Glam-ma a "no"? Just kidding? Happy Gaming.